This year, I will have fun with statistical analysis, and share the results using my R publisher engine. I share my super brief thoughts, pictures, and the links to the articles of mine and others on Twitter. I gain some satisfactions when my tweets get a lot of engagements (i.e. getting retweeted, favored, replied, followed, and etc). Ultimately, I think the level of engagements is about the match between what I tweet and what my followers are interested. But it's also true that not all followers will see the tweet at a given time. I'd like to maximize the exposure. As far as my tweets go, it is most effective if I tweet at 11pm, Pacific Standard Time. This may be because 68% of my follwers are Japanese. That is 4pm in Japanese Standard Time. Below is the details of the analysis over my tweets, and the conclusion should not be extended outside the scope of this data that is my twitter activities in 2014. 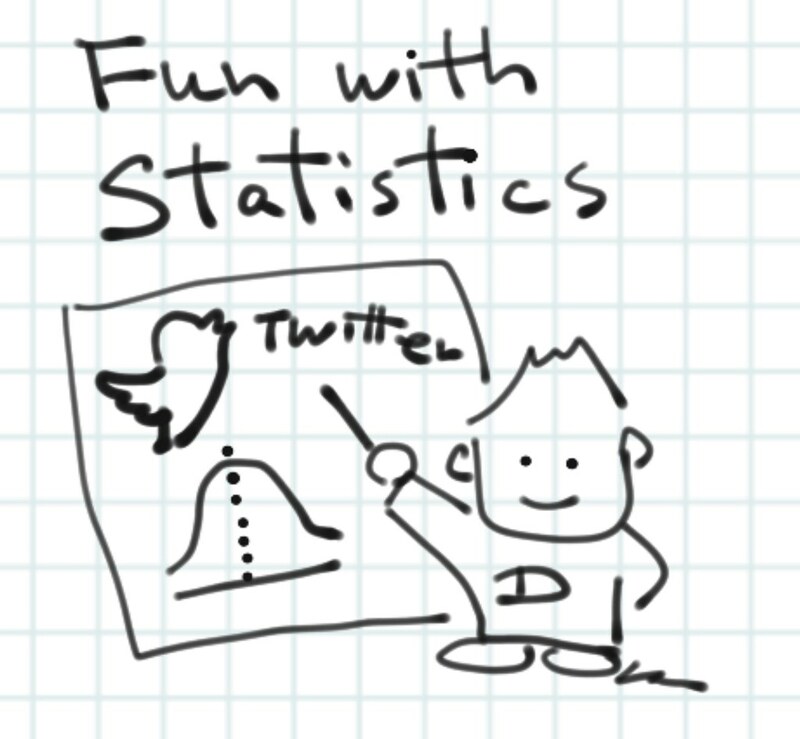 The raw analytics data can be obtained from http://analytics.twitter.com as CSV file. A copy of the data of my tweets is stored for reproducibility of this study at the time of the data retrieval (See the source code). According to the data, I tweeted 911 times in 2014. Twitter did not attach a metrics data on some of the tweets, and the total number of the tweets with valid metric data is 851. As of January 3, 2015, I had 869 followers. The data is skewed by some extremely high impressions (up to 9385 impressions) that occurred a few times because of retweets by extremely influential Twitter users. So, I removed 9 “lucky” tweets with exceptionally high impressions (over 390 impressions, 99th percentile) in the following analysis. Table 1 is the summary of statistics after removing the outliers and Fig. 1 shows the histogram of the impressions. As in Fig. 2, there is a slight dent around 7am PST. I also notice that I do not tweet much between 0am and 4am PST (10 or less tweets). So I excluded the time range from the following analysis. Student's t-test shows p-value of 0.0247 and the 95% confidence interval of -65.0702 and -4.6989. I reject the null-hypothesis. Figure 3 is the box plot of the impressions between the two groups. For the tweets between 5am and 11pm PST, m, the number of minutes passed 5 PST, is calculated. Correlation between m and impression is 0.1072 (p-value = 0.0023) (Fig. 4). Figure 4: Plot between the minutes passed 5am and impressions. Blue line indicates the linear model. While there was not a strong linear trend between time of day and number of impressions, there is a significant difference of impressions between 7am and 11pm PST that are the hours with lowest and highest average impressions. A Report from bit.ly suggested to post early afternoon (1 to 3pm) for a high click count. The difference in my case is that 68% of my flowers are Japanese, and 11pm PST is 4pm in Japanese Standard Time. The high impression around this time may be due to the high activities in Japanese users. This R markdown document was processed with R version 3.1.2 (2014-10-31) on x86_64-unknown-linux-gnu (64-bit). In the first version of this post, there was a coding error in R script which drew a completely opposite conclusion. You can see the difference between Versions 1 and 2. You can also see the entire change history of this post.